Well, I did it. Crossed the first major milestone off my get-back-to-shape-after-baby plan with my finish at the inaugural Nike Women's Half Marathon in DC on Sunday. And, despite some gnarly toenails and soreness in my quads, I feel pretty darn good about it two days later. By no means was this a FAST half for me. Lacking a strong base and any speed in my legs, I knew I couldn't even attempt to go near my 13.1 PR of 1:34. Rather, I was just hoping to negative split and finish under 1:50. A stellar day would be 1:45, but that would require 8-minute pace, something I had yet to achieve in my training runs. My time? 1:45:04. I didn't negative split--I did just the opposite. Try as I did to take it easy over the first six miles, I found myself swept up in emotions and charged with adrenaline that had me logging a 7:24 fourth mile (what was I thinking?). Funny thing is, I felt AWESOME doing so. Big-smile-on-my-face, slapping-hands-with-strangers, pumping-my-fist-to-the-beat-of-the-bands-on-the-course kind of awesome. After being out of the racing scene for so long, I embraced each moment and kept telling myself to enjoy the ride. Blame post-pregnancy hormones, but there were even times I found myself tearing up as I ran...when I came upon a woman with a photo of herself at the bedside of a woman obviously battling cancer pinned to the back of her singlet...when I ran past the many, many "Boston Strong" signs and t-shirts. Especially in the final miles of the race, those photos and words pushed me to run for those who can't, and reminded me how lucky I am to be able to just get up and race. And let's talk about those final miles, shall we? As we rounded Hains Point, my hip flexors began acting up. Then, my feet. And I was only at mile 9. Oof. I knew these issues were direct results of undertraining--my longest run prior to this was 11 miles--but I also knew that nothing was painful enough worth stopping for. So, with my form falling apart and my strong gait reduced to a shuffle, I kept plodding along. Mile 12 was the worst--so many people passed me!--but once we made the turn for the homestretch, I pulled myself together and tried to take in the magic of making your way to the finish line. And I was thrilled to get there and find my family and friends, and cheer for my amazing sisters-in-law; all three were running their very first half-marathon. They rocked it out! This race will be one on my list for years to come. Loved the vibe, the spirit, and the course. 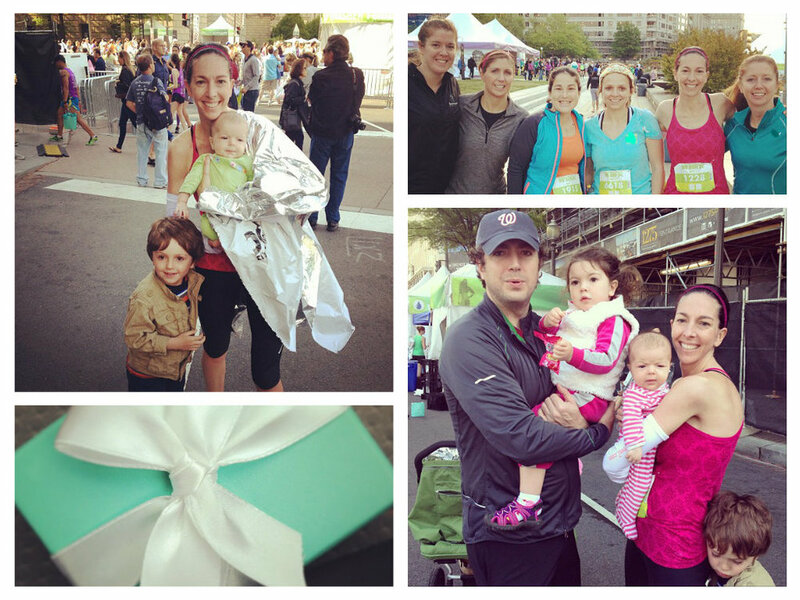 And let's not forget about the perks: To be greeted by Shalane Flanagan, Joan Benoit-Samuelson AND a pretty little Tiffany's box at the finish line was more than cool.